We dived into endless options for the best full face snorkel mask and came up with some of the best on the market. Our research will help you find the perfect snorkel mask for your upcoming vacation, as a gift, and more. It’ll provide you with clear vision, so to speak. Soon, you’ll be gazing into the depths with a renewed sense of wonder. Now: Before we get started, here’s what you need to look for when shopping. Anti-Leak: Ask an Olympian swimmer how important the anti-leak feature is, and you might get a lengthy speech. Even if you're not doing the 400 freestyle just yet, it's good to know if your snorkel mask was made with anti-leak technology. 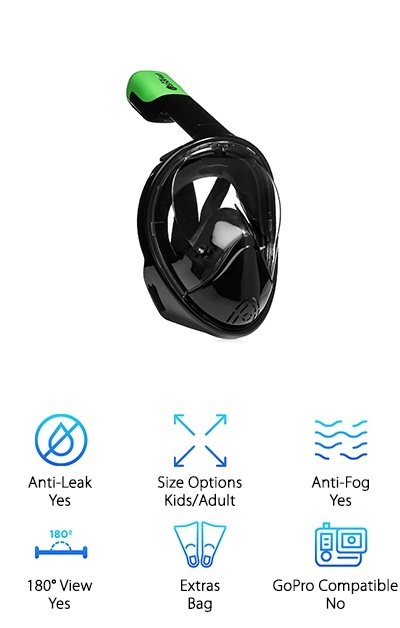 Size Options:The top snorkel masks are on this list, and while some come in a variety of sizes, others are designed specifically for adults or kids. Take a look to see if the mask you like most will fit you or your family. 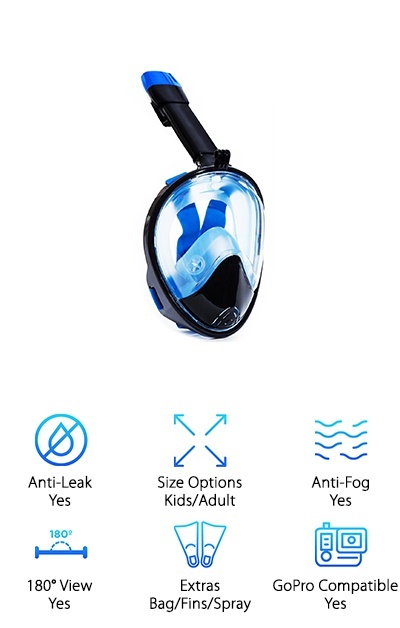 Anti-Fog:The anti-fog feature on a snorkel mask means it won't cloud up as easily from either your breath or from swimming in warmer or colder water. It can be handy, depending on how you need to put that mask to use. 180° View:A mask with 180 degrees of viewing potential could translate into a lot of beautiful tropical fish suddenly catching your attention. Essentially, the mask is extended on both sides of your face, providing you with clear peripheral vision. Extras: Some masks come with a breathing tube, while others don’t. Then there are mask-and-fin snorkel sets, which could be handy as well. Check out this category to see all of the extras you’ll get with your snorkel mask purchase. GoPro Compatible: Do you want the memories you’re making under the water to last forever? Some masks are designed to include a clip or ledge where a GoPro or another underwater camera can be attached. In other words: What an awesome souvenir! Now that you know how to choose the best snorkel masks around, we can get right into our full purchasing guide. Here's the deal: if you're in a rush, look at our top pick and our budget pick. Both are dynamite products and are among our favorites. Right below, you'll find the remaining 8 best full face snorkel options. If you’re looking for a mask for either yourself, a friend or a loved one, this is the best place to be! Are you planning to take the plunge? Do it with the Octobermoon Original. This full-face snorkel mask has all of the bells and whistles you could possibly need to make your next swim truly memorable. The idea of snorkeling can bring up images of tight masks, foggy views and botched attempts to view the wildlife. Dismiss those disappointing recollections and keep your view bright and clear. Here's the deal: the Octobermoon mask is a panoramic, 180-degree experience. You will see above and below with nearly effortless clarity. It gets better: This mask is anti-fog, thanks to a completely separated breathing chamber. Overall, it's also anti-leak. The silicone lining is built to keep any drops from making their way in. Under the water, you'll drift happily along, breathing securely and watching sea creatures at play. This makes a wonderful purchase for a family vacation to Hawaii or the Bahamas since it comes in both child and adult (small and large) sizes. So much of the ocean remains a mystery to us. Luckily, we found a full-face snorkel mask that will help you discover more of the world under the water. Our budget pick is the SeeWorld 180 Snorkel! You and your kids will love its innovative design and bright colors. Select from shades like light blue, green, pink and black. The mask’s edges fit around to frame your face, and the lens is curved to provide that coveted 180-degree view. The elastic head strap lets you adjust the fit, and then the anti-fog technology keeps you from needing to continually accommodate as you swim. It's also anti-leak, so you can keep your head down and cruise for hours. Enjoy clear sights and crystal waters to your heart's content! But here's the kicker: this is a truly affordable mask and one you will keep around to use over and over again. Book your next vacation with the SeeWorld 180 Snorkel, and enjoy the view! Want to get away from it all? Our full-face snorkel mask reviews will have you dreaming of sandy beaches, bare toes in the tide, and a frosty beverage with a tiny umbrella on top. Whether you'll be swimming in the water in your backyard pool, or paddling the Caribbean, you need a mask that will let you fully experience the wonders around you. The SeeReef Full Face Snorkel is a popular choice for underwater sightseeing! Here's why: it's got 4 valves built in to help you draw many fresh breaths while keeping your head down. There is also an extra-long snorkel to extend above the surface. To add to your comfort, your purchase includes two different sets of earplugs. Either the standard plugs or the super-mold option will help to make you a serious adventurer. Here's the scoop: Like many of the best masks out there, this one gives you a 180-degree view. 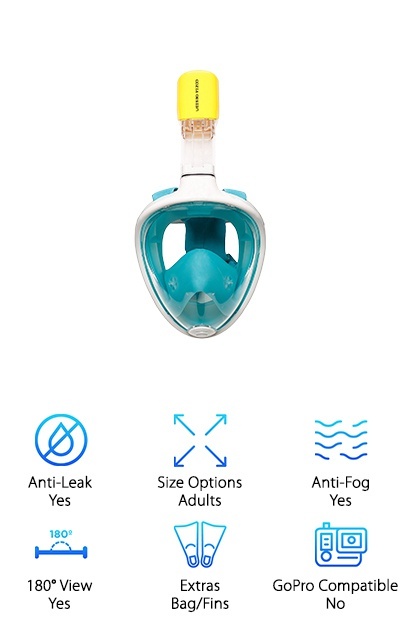 It's also anti-leak, and anti-fog. Snorkeling is one of the world’s most popular pastimes because it couldn’t be easier. You don’t have to be a world-class swimmer. You barely need to know how to float, in fact. It’s the waterlogged equivalent of couch-surfing. So while you may not burn many calories, you’ll be comfortable and cozy floating along with the Easy Snorkel Mask. Kids and adults can choose from black, blue, deep blue, green, pink and purple color options. These goggles come in two sizes. 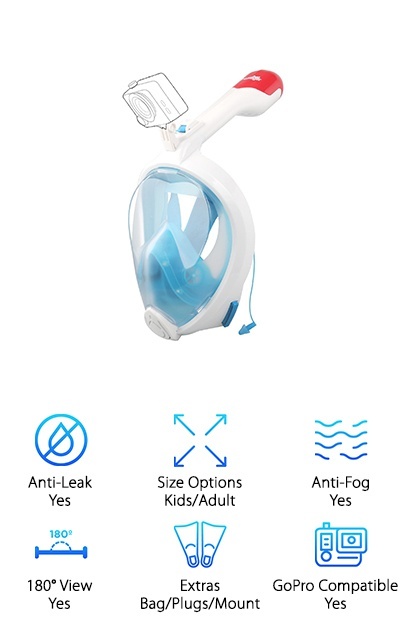 Whichever size you get, they include anti-leak technology for a clear experience. The 180-degree lens will also help, along with the flexible elastic headband for getting the fit just right. They are also anti-fog! Finally, there's the "free breathing" design: you don't have to breathe into a mouthpiece, so it will feel really natural. The mask is built to stop salt water from coming back in and prevents gagging. You'll get a handy carrying bag for this mask as well! Your day on the water is probably something you’ve planned out way in advance. It should be relaxing and fun for the whole family. 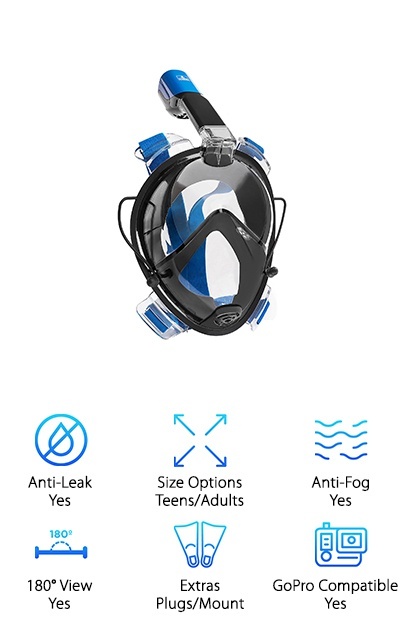 They’re going to have a blast if you include the Seaview 180 GoPro Snorkel Mask from Wildhorn Outfitters. Better yet, you'll have a new way to record the whole thing with this mask's handy GoPro mount. Click the camera on, and create memories that will last a lifetime. Think about it: Kids and adults will love how easy this mask is to use. It has 180 degrees of viewing power, with one of the biggest lenses on the market today. 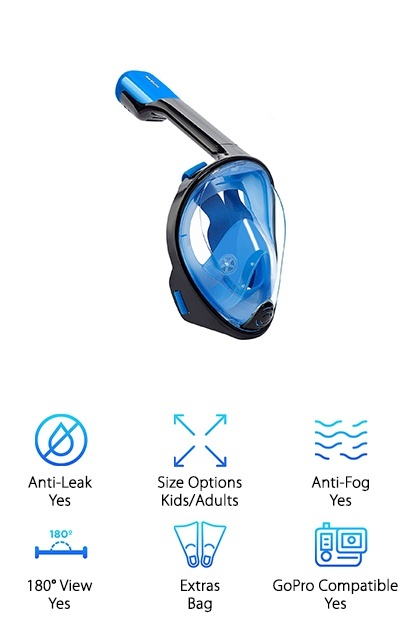 It's a dry snorkel, so you will breathe freely through your nose and mouth without having to grip a mouthpiece and worry about water coming in. Airflow is also directed away from the upper half of your face, so things won’t be fogging up as you peer into the depths. This mask is a clear winner! The best snorkels and masks come with lots of customizable options. And you won’t believe how flexible the X-Lounger Snorkel 2.0 can be! Take a look: Let’s start with the foldable snorkel tube. At over 9 inches long, it folds down for easy transportation to a tropical isle. Then there is the detachable GoPro mount AND extension pivot arm. Record blissful memories from brand-new angles. This is crazy: this mask is both anti-leak and anti-fog. How? The drain valve allows you to drain excess water from the mask if it enters, without ever interfering with your breathing. There are also separate inhaling and exhaling channels. Finally, there is an anti-fog coating on the lens. The small/medium and large/XL sizes will fit both kids and adults. Pick from three colors, pink, blue, and black. There’s an adjustable headband with a buckle to get just the right fit. And here are the other extras: a mesh bag for drying, a backpack for carrying, and earplugs. The great outdoors is a little more accessible… with the right accessories! Leave room in your backpack or your suitcase for the Snorklestar Full Face Mask. Why? Because it comes with everything you need for a truly marvelous snorkeling experience. Here are the details: This mask is designed for both children and adults. 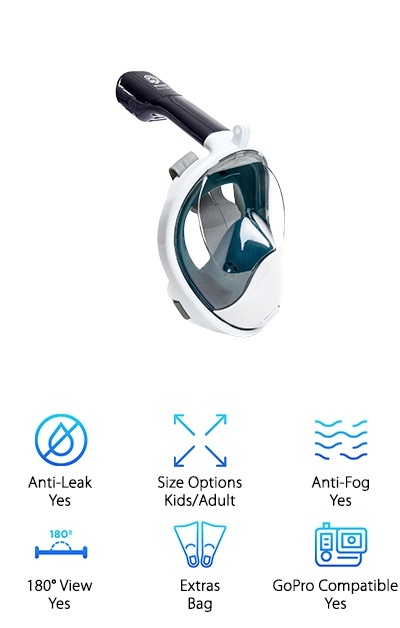 Kids will feel comfortable in the water, enjoying the 180-degree polycarbonate lens and extra-long snorkel tube. Select from 3 different sizes to find the right fit. It’s anti-leak, too! There’s an integrated GoPro mount at the top for your camera. And check this out: the extras really are amazing. You’ll get a dry bag, perfect for putting your valuables in and keeping them totally dry as you swim. 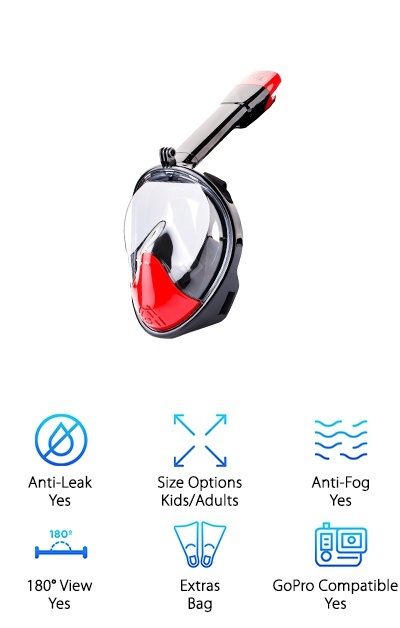 Anti-fog spray is provided to give you one more way to keep your vision crystal-clear. And finally, the mask comes with a set of fins! You will be unstoppable as you hunt for the brightest tropical fish. Traditional snorkel sets come with two pieces: the goggles, and the tube, which can be unwieldy and hard to adjust. Say goodbye to the old, and hello to one-piece snorkel masks like the Ocean View Snorkel Set from COZIA Design. Picture yourself breathing naturally as you gaze down at turtles, fish, and dynamic coral reefs. It’s possible! 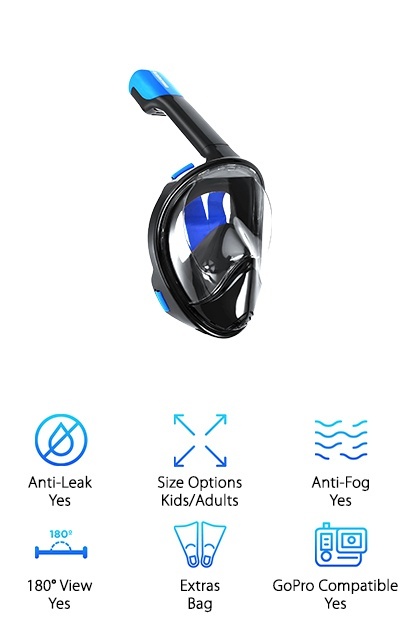 This snorkel separates the breathing chamber from the upper part of the mask, which stops fogging and gets you snorkeling longer. There is also a one-way drain valve at the bottom to get rid of that leaked water. The face padding is silicone and should stay comfortable as you navigate smooth or choppy seas. Our reviewers also loved that this mask comes with fins. They are adjustable, so you can strap them on and speed through your sightseeing. Or, pretend you're a dolphin and try to blend in. You'll look like an alien, but feel at home with the Ocean View Snorkel Set. It’s time to jump in and explore your world! 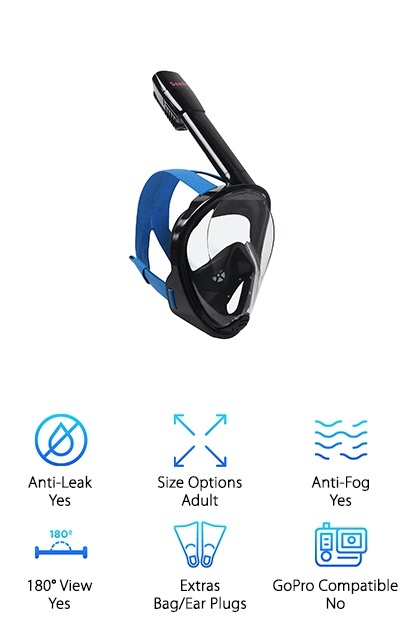 Everyone will love the freedom that comes with the Shark’s Friend Full Face Anti-Fog Snorkel Mask. It’s the perfect choice for your next getaway or vacation. A 180-degree panoramic view will be yours once it's securely strapped on. It should stay that way, too, with the anti-fog and anti-leak features. The silicone seal will keep water out. A separate chamber with free-breathing technology also helps with leaks and fog. Plus, you don’t have to deal with a mouthpiece. Just pull the adjustable straps to tighten, and go! Check this out: Kids can pick from blue or pink, while adults can get either yellow, black, red, pink, or green. Load your mask into the included carrying bag, and enjoy both snorkeling and surface diving. Oh, and there’s more: Hook your GoPro camera onto the mount, and start recording. You’ll cherish these images for a long time to come. The ultimate family outing should come with a little underwater sightseeing, don’t you think? Give them all something to remember with the IndigoMer Snorkel. Functional and sleek, it will revolutionize the way you spend your free time in the water. Here’s one example: this lightweight mask has that classic 180-degree design to see all around you. There is no rubber mouthpiece to bite down on! Breathe easily in your own oxygen “bubble,” meant to keep out any leaks. Dry snorkel technology will help with that, too, along with the silicone seal. Teens and adults can find the best fit by choosing from either the small/medium or the large/XL size. Earbuds come built-in, and there is also a GoPro camera attachment. They’re made to keep from fogging up, so you’ll have to drag your kids out of the water when it’s finally time to head home. So what are you waiting for? These masks also make awesome, affordable gifts.